Increasing urbanization and road congestion are pushing commuters toward alternative modes of transportation for short and medium distance journeys. The German Federal Environmental Agency study reveals that Low-Speed Vehicles (LSVs), such as e-bikes, are faster than cars for covering distances up to 10 km (6.2 miles) in urban environments. Most urban journeys are much shorter than this. Shared LSVs (bicycles, eBikes and eScooters) are well suited to fulfill the gaps in the last mile of commutes. 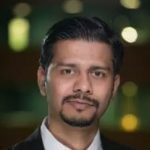 As a result, many startups have emerged with solutions aiming to capitalize on the LSV business opportunity. Key ride-sharing companies like Uber, Lyft etc. have also acquired promising sharing mobility startups to further extend their portfolios. Lyft acquired Motivate in June 2018. Motivate now operates – white label – services in many large cities, including Ford GoBike (San Francisco Bay Area), Citi Bike (New York and Jersey City), Divvy (Chicago), CoGo Bike Share (Columbus, Ohio), Capital Bike Share (Washington, D.C., Arlington and Alexandria, Virginia, and Montgomery County, Maryland. ), Hubway (Boston, Somerville, Cambridge and Brookline, Massachusetts. ), Bike Chattanooga (Tennessee.) and BIKETOWN (Portland, Oregon). Ford is a sponsor as well as a strategic partner with Motivate in the San Francisco Bay Area. Ford is looking to get the benefit of consumer mindshare, as well as draw insights from sharing-mobility usage data for future strategic decision making. However, Ford’s GoBike riders provide very limited information about themselves. 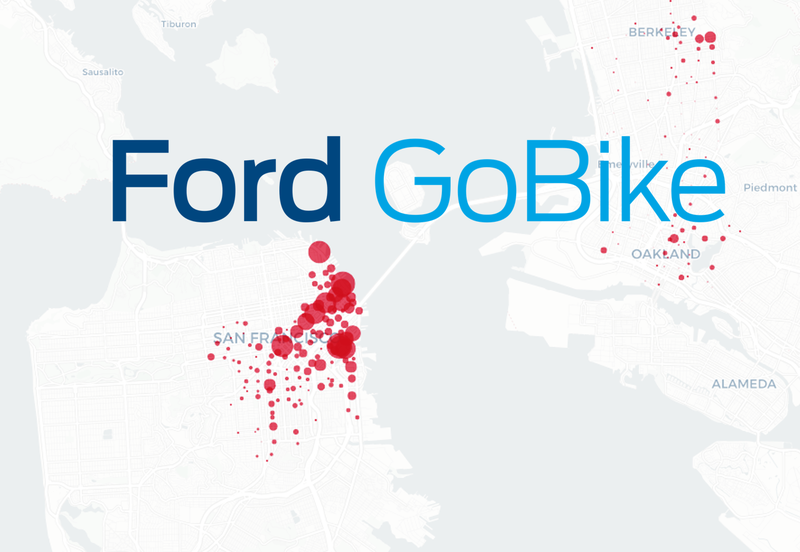 This article, therefore, aims to provide a quick overview of the GoBike user portfolios by analyzing usage data released on Ford’s GoBike website. The dynamic cultural buzz of the Bay Area and its pleasant climate conditions have influenced many users to adopt the bike sharing habit to go around the city. Ford’s GoBike completed close to two million rides in the San Francisco Bay Area in the last 17 months. However, the above milestone is much smaller relative to New York Citi Bike (another Motivate bike sharing service), which delivers more than a million rides a month in the New York. In contrast to the Bay Area, New York City is more densely populated, with crowded roads. Riding a bike, therefore, is quicker and easier to cover short distances. Bike sharing services fulfill the need of last mile sharing mobility options in both the above urban scenarios, with different use cases. Almost five out of six riders are part of a subscription package. However, there is no significant change to the ratio between subscribers and casual riders over the last year. 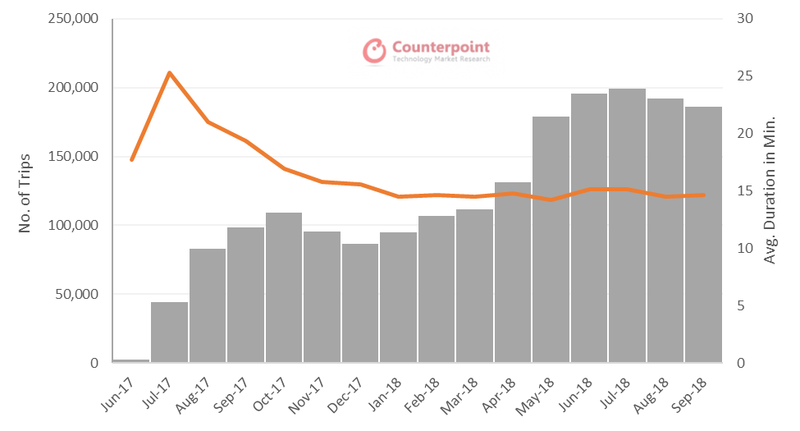 This flattening trend possibly suggests casual riders are not finding enough reason to take up subscription packages. Motivate may raise the pricing for casual riders to push them towards small subscription packages. Simultaneously, Motivate can also target frequent casual riders with customized plans to convert them into subscription riders, though this will require it to have at least contact information for them. The Ford GoBike tagline is “A fun and affordable way to get around” with pictures of young adults. They successfully target the exact demographic that’s using its bikes. Around 44% of riders are under 30 years of age. The average trip duration is around 15 minutes. This is unsurprising. Only one in four riders are female, which is possibly why Ford’s campaigns are aimed at encouraging women to consider its service as it seeks to exploit this relatively untapped segment and balance the ratio further. Many females are more concerned about safety than males as well as the propensity for cycling to have negative cosmetic side-effects such as messed-up hair. It’s fair to assume that the ratio will likely not close completely, though, in European countries where cycling is normal, the ratios are balanced or even tilted in favor of female riders. GoBike is popular during weekdays. The number of trips taken on weekdays is 48% higher in comparison to trips taken on weekends. Many riders are using it to fulfill their last mile commutes to offices or universities, with ride-sharing frequency peaking between 8 AM – 10 AM and 5 PM – 6 PM. Again, this is unsurprising. Weekend usage is also quite good but there will be necessarily fewer trips taken outside working days. 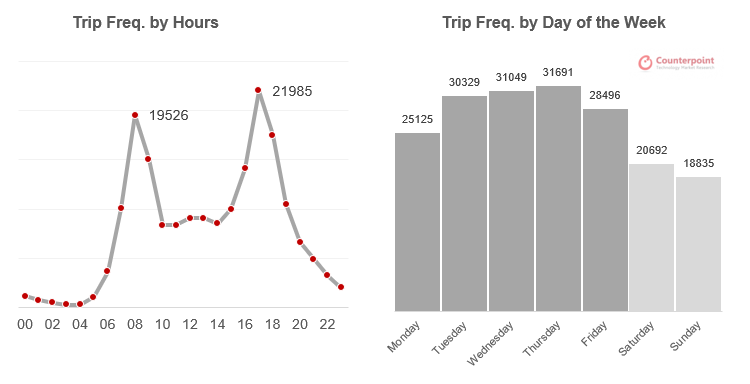 Go bike trip frequency was highest on Thursday, followed by Wednesday and Tuesday in the month of September 2018, Mondays had the fewest trips. Our interpretation is that Mondays are likely the day when people are least organized to use the service as they return to work and study after the weekend. They get progressively readier to use the service during the week. Friday is the day most people will take off from work if making a long weekend or are more likely to work from home – thus reducing the service demand. GoBike is popular among office commuters working with tech companies like Uber, Twitter located in Market Street, San Francisco. Other popular riding stations are located near major public transport hubs i.e. a few of them located near Caltrain Train Station, other popular spots included San Francisco Ferry Building (Harry Bridges Plaza) and The Embarcadero at Sansome St. These are predictable results. Companies in the tech sector attract a young and environmentally aware workforce. Those that live in the city are less likely than average to be car owners. This also applies to those commuting by public transport. Many students use GoBike. As a result, Bancroft Way at College Ave, Bancroft Way at Telegraph Ave are popular docking locations, with their proximity to universities. San Fernando St at 4th St. and 5th St at Virginia St is the most popular station in the San Jose area with its location near San Jose State University. The interactive map below provides an overview of popular GoBike sharing stations, along with trip frequency details for the month of September 2018. The LSV market has opportunities for growth over the next 5–10 years, driven by technology innovation as well as in increase in consumer awareness of short distance personal mobility options. LSVs further add to an overall economic goal in developing sustainable transport solutions for urban areas. Ford Motor Co. has acquired Spin, a Scooter sharing company based in San Francisco. Spin operates in nine cities and five college campuses. This is another strategic investment by Ford to expand its mobility portfolio. Despite obvious benefits, scattered LSVs in busy public places can cause a nuisance for local people and pedestrians. Dealing with the issue, San Francisco introduced a temporary shared bikes service ban in June 2018, followed by a new regulation limiting the city to 2,500 LSVs and to a maximum of five operators. Subsequently, another ban was imposed in the Santa Monica area. Authorities from Santa Monica later approved 1,000 electric scooters from Bird and Lime, as well as 2,000 dock electric bikes from Lyft and Uber-owned Jump Bikes. These companies can operate for 18 months, during which time they will pay $1 tariff per day per vehicle towards supporting infrastructure projects, including bike lane installation and upgrades. Spin has been affected by the recent regulation limit on LVSs in both San Francisco and Santa Monica. Other urban places will likely face similar issues. But before it gets too big, sharing mobility companies should liaise with central authorities to agree on ground rules and/or more formal regulations. Key players who take the initiative to support regulatory oversight can likely benefit from being early-movers and take advantage of potentially securing strategic locations for future expansion in major cities.